There are lots of different wine coolers, wine refrigerators and wine cellars out there. The key difference between them is what kind of cooling system they use. If you’re not really sure what the difference is, or which one is best for your wines, then you’re in good hands. Here’s the difference. A compressor wine fridge works like a regular refrigerator. It needs refrigerants such as freon to generate cold air within the fridge. The molecules of these refrigerants go through a compressor system and create heated vapor. A condenser then turns the vapor into cold air and an exhaust fan expels the hot air from the fridge. What’s great about compressor coolers is that they have a more powerful cooling capacity. They can cool their contents down to 39°F (3.9°C). They’re perfect for chilling white wines with larger bottles or other beverages. 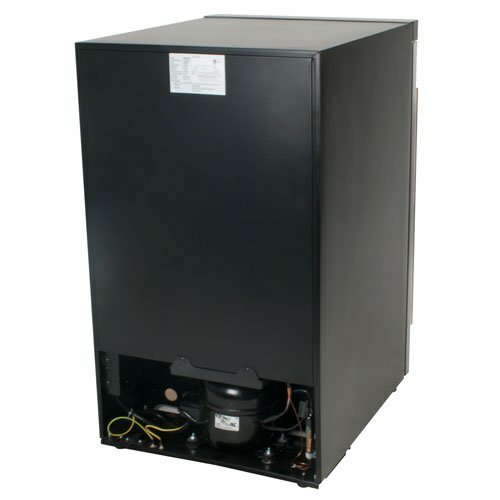 Since compressor coolers are usually large, they tend to have a higher storage capacity. Wine coolers with compressor cooling systems also maintain temperatures more consistently compared to thermoelectric systems, which typically depend on ambient temperatures within the room. Before buying a compressor cooler though, you should consider a few drawbacks. Since compressor cooling systems have many moving parts that frequently switch on and off, they tend to be a bit noisier than thermoelectric systems. The sound they make is comparable to a regular refrigerator. It’s not obnoxious, but it is noticeable. In addition to that, compressor cooling systems give off micro-vibrations which may affect the aging of your valued wines by disturbing the sediments. Though these vibrations are minor, they can actually be harmful to fine wines. If you plan on drinking most of your bottles within a certain timeframe, this shouldn’t be a major issue, but if you simply want to store your wines for an extended period of time undisturbed, this is something you may be concerned about. Compressor fridges are also usually built-in, so if you want to install them properly, that will cost you. You do have the option of having your built-in wine cooler be freestanding though. Thermoelectric wine fridges use the Peltier effect to produce thermal flux between two sides, bringing hot air from one part to the other part. One side gets cooler while the other side gets hotter. Like compressor systems, thermoelectric systems also use an inner fan to distribute cool air evenly inside the fridge. Thermoelectric coolers don’t use refrigerants or fluids, making them environmentally friendly. Since they have no moving parts other than the inner fan, they operate relatively silently compared to coolers with compressors. Although when you get to the higher end of the price scale, some of the quietest wine coolers on the market are compressor units. The thermoelectric coolers are also vibration-free, so your wines will be protected. Aside from being beneficial to the environment, thermoelectric wine fridges also use less electricity when operating under the right conditions. 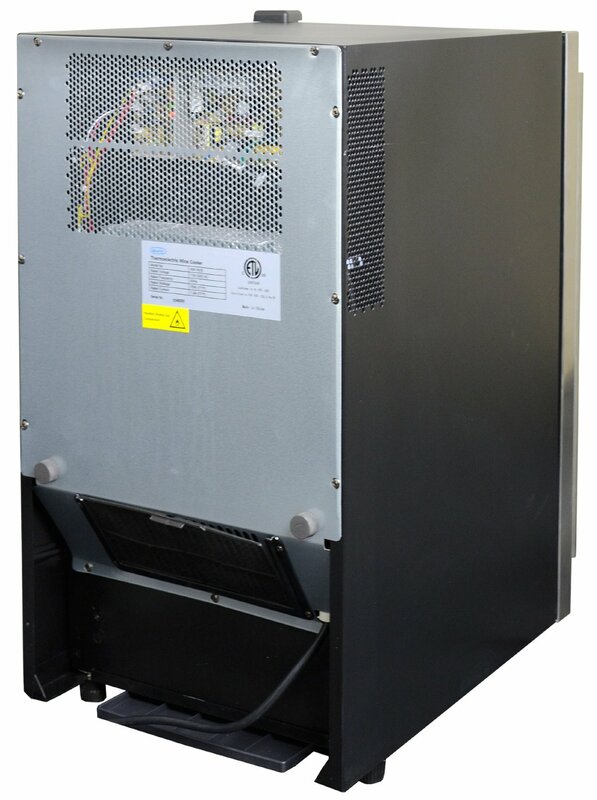 Thermoelectric coolers are usually free standing as well, making them easier to move around or transport. An example of a great freestanding thermoelectric wine cooler is the Koldfront 24 Bottle Dual Zone Wine Cooler, but almost any wine cooler can be freestanding. Freestanding compressor units like the Kalamera 30 bottle wine refrigerator require a little more space for adequate ventilation. Thermoelectric wine coolers also have a few drawbacks. Unlike compressor coolers, thermoelectric wine fridges don’t get quite as cold. The lowest they can get is 44°F. Ambient temperatures take a toll as well. If temperatures outside the fridge are too cold, they won’t function properly, because they don’t have the ability to heat. Putting your thermoelectric wine cooler in your garage or porch area during winter is not really an option. All that being said, do you prefer silent and stable, but easily affected by outside influences, as in the case of the thermoelectric system, or a broad range of temperatures that you can place in any environment, as with the compressor cooling system? While both of these wine coolers have their own advantages, the best one for you is simply a matter of preference.